Citation Information: J Clin Invest. 2007;117(3):601-604. https://doi.org/10.1172/JCI31549. Inhaled environmental oxidants, such as ozone and particulates, have been variably linked to epithelial injury, inflammation, and perturbations in lung development, growth, and function. Reactions between ozone and lung surface lipids likely account for exposure-related pathophysiologic sequelae. In this issue of the JCI, Dahl et al. document a previously unrecognized pulmonary defense against inhaled oxidants in mice: macrophage scavenger receptors (SRs) bind proinflammatory oxidized lipids, thereby decreasing pulmonary inflammation (see the related article beginning on page 757). The study adds to our knowledge of diverse lung oxidative processes and identifies a potential regulatory mechanism governing pulmonary inflammation. Further investigations to elucidate more precise mechanisms and to determine the influence of SRs on airway epithelial injury, repair, and remodeling are warranted. The lung surface is protected against inhaled oxidants. The respiratory tract surface is covered by the ELF. In this example, inhaled ozone (O3) first dissolves in the ELF aqueous phase, followed by facile reaction with antioxidants (e.g., reduced ascorbate, AH2, and reduced glutathione, GSH), which can lead to secondary ROS production. Competing reactions between ROS and ELF unsaturated lipids (ULs) produce specific oxidized (ozonation) products. Influences of ELF protein reactions remain undefined. Due to its reactivity, it is unlikely that ozone directly contacts cellular membranes. ROS and lipid autoxidation initiated by decomposition of ozonation products lead to the generation nonspecific oxidized lipids. Secondary oxidants formed in the ELF may drive membrane unsaturated lipid oxidation, which likely contributes to the overall pool of nonspecific oxidation products. Both ROS and oxidized lipids can directly injure epithelial cells and/or initiate signaling cascades that drive PMN influx. Based on the current report from Dahl et al. 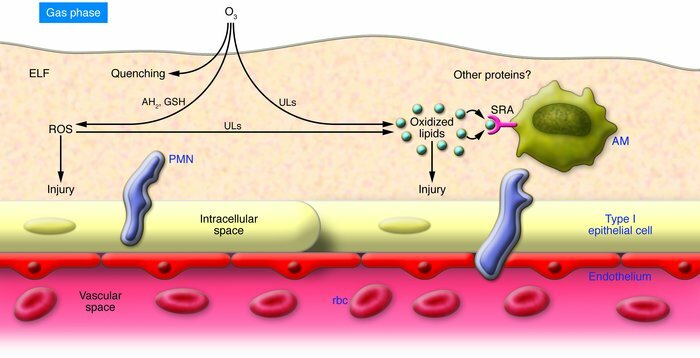 (10), AM SRAs bind and internalize oxidized lipids, thereby reducing their effects on the lung epithelium. The net result limits the extent of bioactive lipid–induced inflammation. The specifics of scavenger receptor–oxidized lipid recognition and binding affinities, effects of scavenger receptor polymorphism, dispositions of internalized lipids, and composite mechanisms of how scavenger receptor–oxidized lipid binding influence PMN influx and related lung surface perturbations await further characterization.